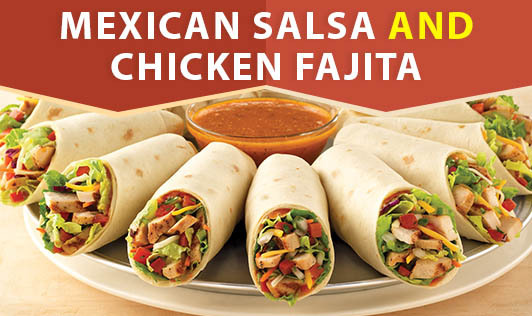 Fajita is a Mexican dish which is healthy and can be easily cooked. This can be rolled up in tortillas or served separately on the side. 3 boneless chicken breast (1/4 kg, cooked) cut into thin strips. 1 medium onion (cut into fairly thick slices). 2 bell peppers (capsicum) one green and 1 red or yellow (cut into thin strips). In a pan heat the oil add garlic and chili allow to turn light brown then add chicken strips. Toss for 3 min then add cumin, salt, pepper, soy sauce and tomatoes toss fry. Add bell peppers (capsicum) & onions. Toss for another 3 min. Heat the tortillas or chapathi for 2 min under a grill. Take each tortilla or chapathi and put approx 2 tbsp of chicken. Apply some sour cream, salsa and mozzarella cheese and roll them. Do the same for all the tortillas. Put in serving plate and serve it hot! * Do not overcook the vegetables. It should be crispy for better taste.